Here's to the cheap lunch! We've got 10 options to keep your stomach and wallet happy. Dig into these cheap eats in Sydney's bustling CBD. 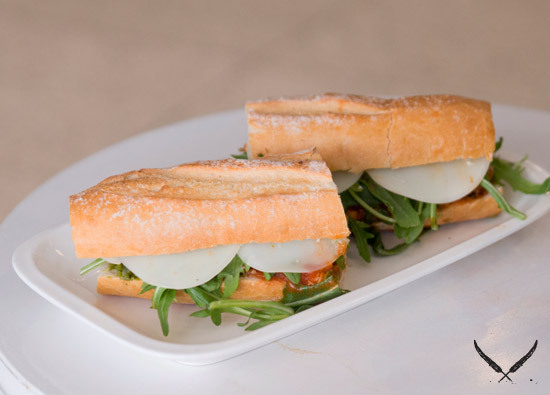 Home to some of the best subs in Sydney, Sourdough Café's adorable hole-in-the-wall set up serves fresh, saucy and delicious subs and sandwiches, all for less than a $10 note. The pulled pork with iceberg, apple coleslaw and relish is a dream lunch, while the meatball sub special is worth every drop you may end up spilling on your shirt. Known for serving some the most authentic Thai food this side of Bangkok at incredibly reasonable prices, Home Thai will serve up a hearty portion of marinated beef salad or classic but satisfying pad kee mao with chicken, pork or beef for less than $10. The friendly dumpling experts at Din Tai Fung will serve you up a hearty lunch that will leave your satisfied and helps the pre-pay day anxieties. You can grab shrimp and pork wonton soup and a vegetarian or pork bun and you'll still have a few coins to spare. Now, who said Michelin-starred food had to break the bank? Located in QT Sydney, Parlour Lane Roasters know the joys of a well-priced and satisfying lunch, and they're offering it up for you. All sandwiches are $9 (try the old school vego club) while a hearty minestrone soup will only set you back $8. How's that for cheap eats in Sydney? Nothing is better than quality food without the price tag, and Central Baking Depot offer a huge selection of lunches that might even cost you less than a fiver. The famous lamb and harissa sausage roll is a cool $4.80, and the heavenly cherry tomato, goats cheese ricotta and basil pesto quiche will only set you back $5.20. Add a slice of carrot and walnut cake to make it an even $10. Who doesn't love cheap, delicious Asian food that is in no way questionable? Madame Nhu's trendy eatery serves up three fresh summer rice paper rolls in a variety of fillings for well under $10, as well as a pho vegetable that will hit the spot every time and only cost you $9.90. You may have to join a queue, or you can get in early, but Ippudo is definitely worth the wait. If you want a lighter lunch and are looking to save some cash, grab one of Ippudo's famous pork buns and a serving of Ippudo pan-fried dumplings and you'll have yourself an easy $10 lunch in no time. You didn't really think we'd leave you without a cheap burger, did you? Parlour Burger know that a juicy hunk of meat in a bun before pay day is a human right, so they've dished up six mouth-watering burgers for your eating pleasure. Ranging from the Indian 'vego' bahji burger to the dirty burger with cheesy beer sauce, you'll soon be there at least once a week. Hooray for Miss Chu and her well-priced, trendy and scrumptious food with the option of pre-ordering to skip the queue! For $9 you can grab a vegetarian egg omelette banh mi that will leave you incredibly full. If you're just after a snack, go for the $10 traditional pork rice paper rolls, or indulge a serve of deep fried spring rolls and a young coconut juice for only $9.50. And finally, we have the famous El Loco and its array of cheap eats, because they know great food doesn't have to be fancy or break the bank. If you're just a little peckish, a $6 taco or $7 chorizo quesadilla will hit the spot, but if you're in it for the long haul, the famous El Loco hotdog will have you satisfied all day and keep a cheesy grin on your face all week. Still feeling a little cheap? Check out even more cheap eats in Sydney right here!